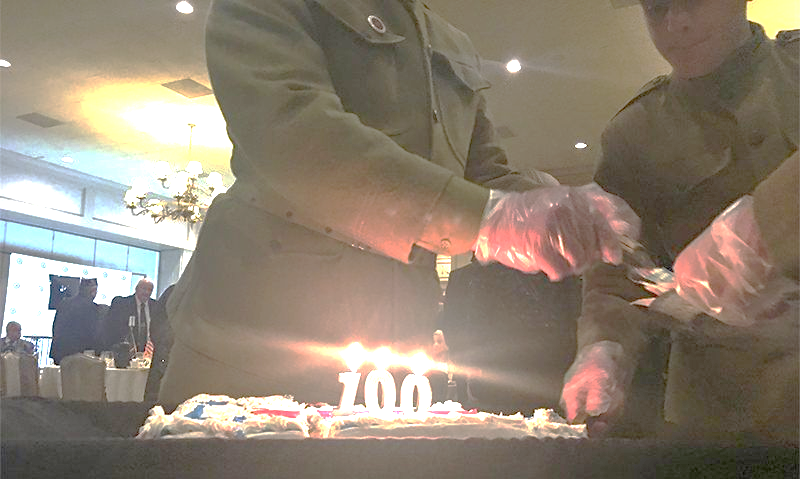 Happy 100th Birthday American Legion! The American Legion Family in Ohio traces its roots to early 1919 and the founding of the organization. The journey that followed produced more than 520 local posts and hundreds of thousands of members over the century (nearly 90,000 today), who have helped countless veterans, servicemembers, students, families, athletes and law-enforcement officers, starting with the World War I generation. Dressed in 1917 doughboy uniforms of the American Expeditionary Forces, re-enactors escorted attendees of the ball to their tables where American Legion legacy and vision were celebrated in speeches, proclamations, music and the announcement of a new Ohio American Legion scholarship to help members of Student Veterans of America travel to their annual conventions. American Legion Past National Commander and Past National Adjutant Robert W. Spanogle reflected on the massive influence one Ohio Legion founder, Frederic W. Galbraith, had on the organization – and on all future veterans in the decades after the Legion was formed. “He emerged as one of the most outstanding commanders,” Spanogle said of Galbraith, first commander of the Department of Ohio and second American Legion national commander. On Aug. 9, 1921, his quest came to fruition when three federal agencies were consolidated into one U.S. bureau to serve veterans, which in 1930 evolved into the Veterans Administration and in 1989 was elevated to Cabinet status as the Department of Veterans Affairs. Galbraith, however, did not live to see completion of his primary goal. He died two months earlier, June 9, 1921, in an automobile crash in Indianapolis. A memorial shrine was dedicated in his memory in Cincinnati two years later, and thousands attended the ceremony to remember what he had set in motion across a century he would not see unfold. Ohio State Treasurer Robert Sprague, a Buckeye American Legion Boys State alum, told the crowd that his experience in the youth program was essential to his career in public service. But that was not the main reason he came to recognize the Legion’s centennial Friday night. Lt. Col. Cole, who had served three terms in the U.S. House of Representatives before World War I, and another Legion founder, Eric Fisher Wood, took on the immense challenge of contacting, in writing, all divisions of the AEF still stationed in Europe, as well as the press, to alert them of the March 15-17, 1919, Paris Caucus that launched the organization. Cole went on to become a devoted Legionnaire in Findlay, Ohio, where Post 3 is named in his memory. Spanogle traversed the century in his remarks, including The American Legion’s role in drafting and fighting to passage the Servicemen’s Readjustment Act of 1944, better known as the GI Bill. He talked of the challenge chief architect of the measure, Past National Commander Harry W. Colmery of Kansas, had in distilling more than 600 congressional and American Legion ideas into one, succinct 10-point plan and the massive team effort it took to get the bill onto President Franklin D. Roosevelt’s desk on June 22, 1944. The past national adjutant and 50-year member of The American Legion also paid tribute to the role Ohio and one prominent department member – John Sommer – played in achieving service-connected disability benefits for Vietnam War veterans suffering with diseases caused by exposure to the toxic defoliant Agent Orange. Air Force veteran Derek Blumke, co-founder of Student Veterans of America and a member of The American Legion’s 100th Anniversary Observance Committee, told the crowd how the organization helped him through the transition from service when, as a 26-year-old veteran, he found himself feeling isolated among more than 40,000 students at the University of Michigan. A number of SVA/American Legion members were on hand for the celebration. Blumke recognized them from the podium and implored his fellow Legionnaires to keep showing them the organization’s value. “Student veterans, it’s now our responsibility to make sure you are getting involved. “In college, I don’t think I truly appreciated the impact this organization has had on our country and our communities,” he said. American Legion Department of Ohio Adjutant Suzette Heller, a post-9/11 veteran who used the GI Bill and was part of the founding generation of SVA, announced that a portion of proceeds from the centennial event would help pay for scholarships to help student veterans attend the annual SVA national convention, which she noted has grown from about 400 attendees when she first started as an SVA member to more than 2,200 at the 11th convention last January in Orlando.